I was playing around with techniques and built a short chart demo. There are many tools out there to create charts. 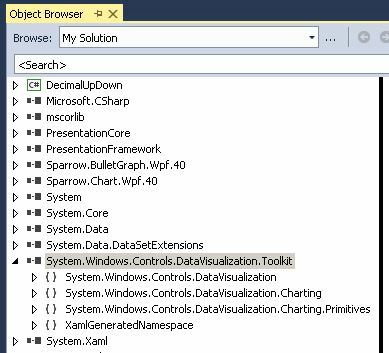 I prefer the good old WPF Toolkit solution on codeplex, which adds the namespace ‘System.Windows.Controls.DataVisualization.Chart’ and is supported by Microsoft. You can expect high compatibility at zero costs. Do not confuse this one with the Extended WPF Toolkit, which is free software, but also offers a commercial solution. 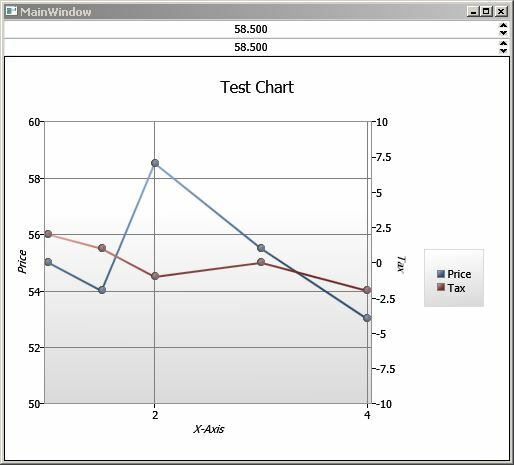 We are going to create various WPF charts in the coming weeks. The programming pattern series will continue at some point afterwards. What topics I choose is always closely related to my personal interests at that time. I find it hard to motivate myself otherwise. This is a very simple example today. I added two NumericUpDown controls to add some flavor. Well, in the WPF Toolkit they are not called NumericUpDown anymore. There are corresponding DoubleUpDown/ DecimalUpDown/IntegerUpDown controls. The lower DoubleUpDown control in this demo is linked to the upper one. And in turn the upper one is bound to a DataContext object property. This demonstrates a chain of bindings. Hence three objects are linked together holding the same value. You can uncomment the prepared block in the XAML code. This will influence the line color and the line thickness. This template has its limits. It does not change the color of related objects. Anyway, it is a good start. The chart has two curves. You can influence one by using any of the two DoubleUpDown controls. The used ObservableCollection to store the curve points could be a post on its own. Basically, it is a WPF collection, which notifies WPF when you add or remove items from/to the list. But how do you update a chart, which only changes a value of a single point? The four methods to invalidate the drawing area are somewhat not showing the expected results. You can set the DataContext to null and then set it back to your source. This is not the fastest way. But practically speaking, changing one value does not happen very often and setting the DataContext is quick and easy. Usually you only add or remove points. If you are looking for animations, they are dealt with differently in WPF. You should have a look into System.Windows.Media.Storyboard for that. In this example I chose to simply remove and add the affected point. You don’t have to re-insert the point at the right collection position. I just did it to easily find the same point again. A simple Chart.Add() would work as well. WPF will most likely not show the point removal on the screen. Tell me if I am wrong. I haven’t seen any impact. I guess the Dispatcher thread is blocked while you are using it on the WPF event call. A signal, which may happen right after the event finishes, will trigger the queued removal and addition in one go.